If you haven't been paying attention to the PTS Facebook Page, then I'm glad, because today's post will come as very new and exciting news. If you have, then my guess is that you'll probably skip over this post and that makes me a sad little panda. It appears that the folks at KWA and PTS (Professional Training Systems), have been in cahoots with each other and have conspired to release some pretty sweet new KWA-based rifles clothed in brand new licensed body parts. Perhaps the most exciting and interesting (at least to me), is the announcement of the KWA gas blowback system that PTS has decked out in all kinds of new licensed components. They're calling this the PTS - Mega Arms Carbine. It is especially exciting to see more and more firearms and accessories manufacturers working with the Airsoft industry to license their products. This can only mean good things for the future of our beloved industry. Check out that skeletonized Mega Arms Standard Trigger! In addition to the PTS Rainier Arms Evolution 9" free float rail system and the PTS Mega Arms upper/lower + standard trigger, this rifle will have PTS Magpul MOE-K grip, PTS Magpul MOE STR Stock, and PTS Magpul MOE MBUS 2 front/rear sights. Here is a different rifle, with a few similarities as the rifle above. Still has the PTS Rainier rail system and MBUS sights, but the lower has the PTS Magpul stamped logo and the muzzle is different. My guess is this is either a KWA electric recoil gun or gas system, internally speaking. Here's a shot of another new rifle being introduced. 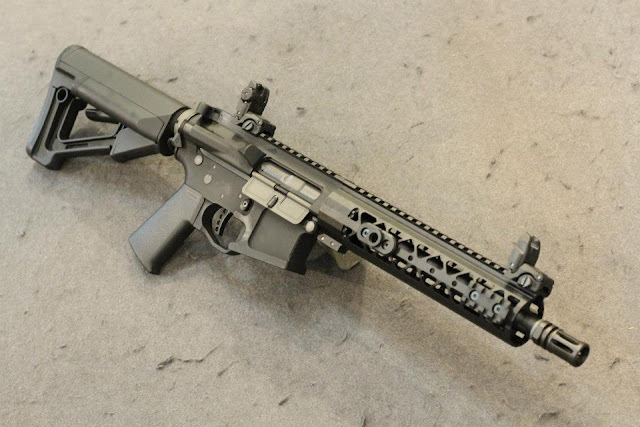 This is the PTS Iron Ridge Arms IRA-X THOR AEG. The firearm version is a .308 platform, and so, to remain true to its real counterpart, the PTS version will feature a PTS PMAG 20LR Mid-Cap magzine and an all-metal, one-of-a-kind .308 receiver with Iron Ridge Arms markings. 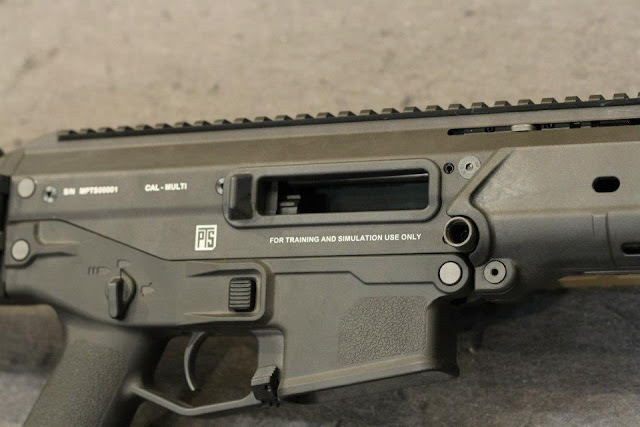 It was announced as an AEG, but no word on who did the internals. 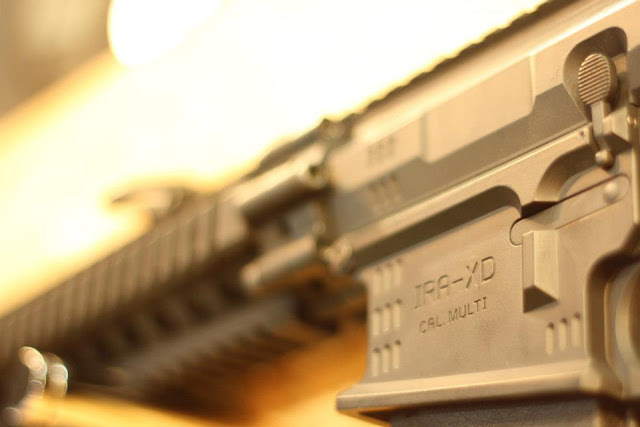 Here's a close-up of the PTS Iron Ridge Arms IRA-XD trades. 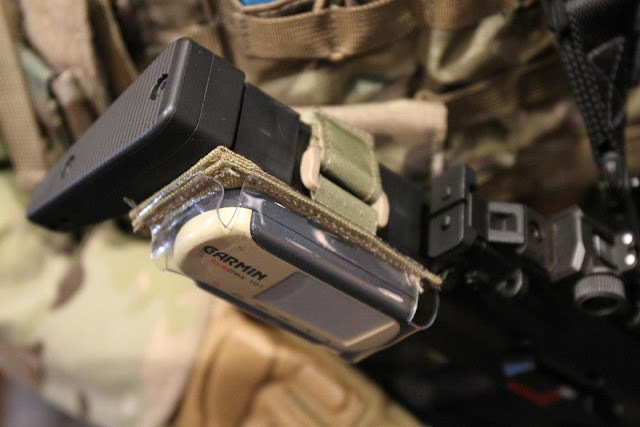 Moving into the airsoft submachine gun category, PTS also had an S&S GPS Pouch for the HK MP7A1 SMG on display. Referring again to the comments on their page, they indicated this will work for right or left-handed shooting configurations. And lastly, this may bring some excitement to many of you out there. 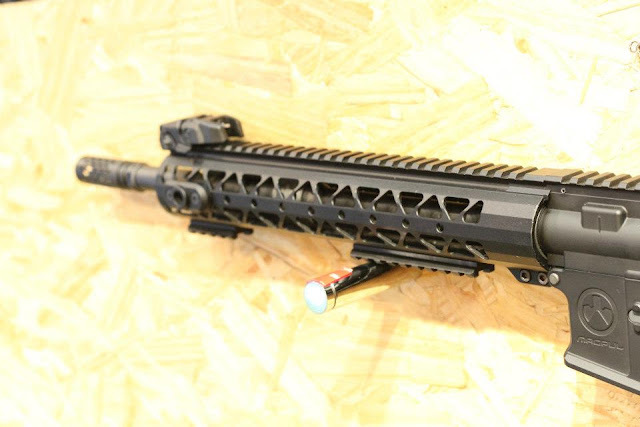 They also announced that KWA would be producing a licnsed PTS Magpul Masada Gas Blowback Rifle. Boom. 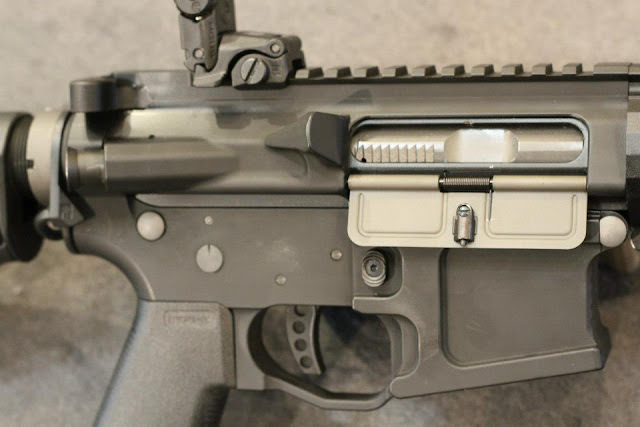 Some of you may recall that there was a drop-in GBBR kit for the AEG announced that was WA/G&P-based, but I'm not sure if it ever came to fruition. Now, they'll have a KWA-based GBBR Masada built and ready to go out of the box. This definitely has my personal interests all over it. I love me some sweet gas rifles.